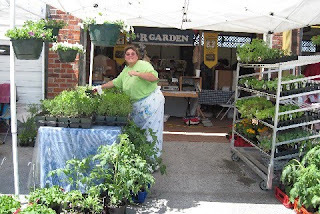 'R Garden Veggies: Farmers Market SpringFest. Yesterday was NBFM SpringFest. Wow what a great crowd we had. We were all very tired by 4:00 but it was a great time. I sure hope it impressed people to want to come to the FM every weekend. Now is the season, more and more vegetable farmers will be coming out to the market. We had a few of our lettuces, so next week there will be more. 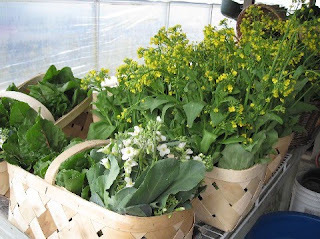 One of our new vegetables is Choy Sum a baby type of Bok Choy that you can eat the flowers, stems & leaves. When I cook it Terry says it taste like I added butter, but I didn't. Radishes and spring onions are starting to be ready also. 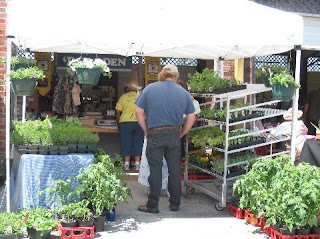 Terry started at the Onslow Farmers Market yesterday also. It was a great turn out there too! So if you are in the Jacksonville NC area on Saturdays 8:30-1 drop by and see 'R Garden and say "Hi" to Terry! Our Booth at the NBFM from the outside.